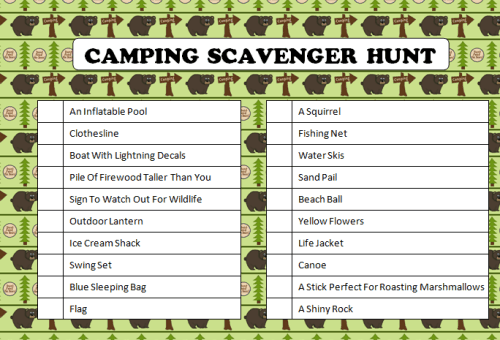 In preparation for the upcoming long weekend, here’s a fun free printable camping scavenger hunt that you can do with your kids while out for a walk around the campground. Have them point out the items to you as they find them. Since every campground is different, you can play this game again as you travel to a new area. It’s a great way to discover more fun things to do around your camp area. Who knows – while out searching for scavenger hunt items you may run into a new playground! Which of these camping scavenger hunt items do you think would be the most difficult to find? What are your favorite activities to play when you are camping as a family? For more freebies for family fun, head over to our Free Printable Games page. We have loads of scavenger hunts, charades, word searches, trivia games and more. If you can’t find what you are looking for, let us know and we’d be glad to help you. I say “we” because all of the Moms & Munchkins readers are part of a fun community. Have you joined our social media accounts yet on Facebook, Twitter, Pinterest or our new RSS feed Bloglovin’? Stop by and join in on the conversations. We look forward to welcoming you to the group! Have Fun & Happy Trails To You! Love this scavenger hunt list, really great idea for kids of all ages! Thanks for allowing me to add your post to my Camping Round-Up Cheryl. I’m dropping by from the After School link party. This is such a great idea. I’m pinning to use this so that the next time we go camping with the grandkids that I can use this fabulous idea. I have a link party that I am trying to grow. It is Grandma Ideas Sharing Time at http://grandmaideas.com. It runs from Wednesday 12:00 a.m. through Friday night at midnight (Mountain Daylight Time). I think my readers would love this idea as much as I do. I encourage you to share this — and a couple of other ideas, too.